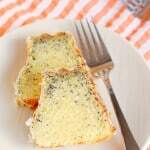 So, a funny thing happened on the way to posting this recipe. In fact, after a major kitchen blunder, I didn’t think I would be posting this recipe for at least another week. I thought I’d have to remake the cake to get a nice photo for you. You might think that after 30 years of baking for a living I would no longer make stupid, completely avoidable mistakes. Well, I wish I could say that’s true. Honestly, I make dumb mistakes on a fairly regular basis. 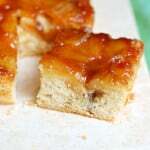 Most of my baking disasters can be traced back to one thing, impatience! A while ago I posted a recipe for Rhubarb Pie and told you how, because of my impatience, I ruined Easter dessert. 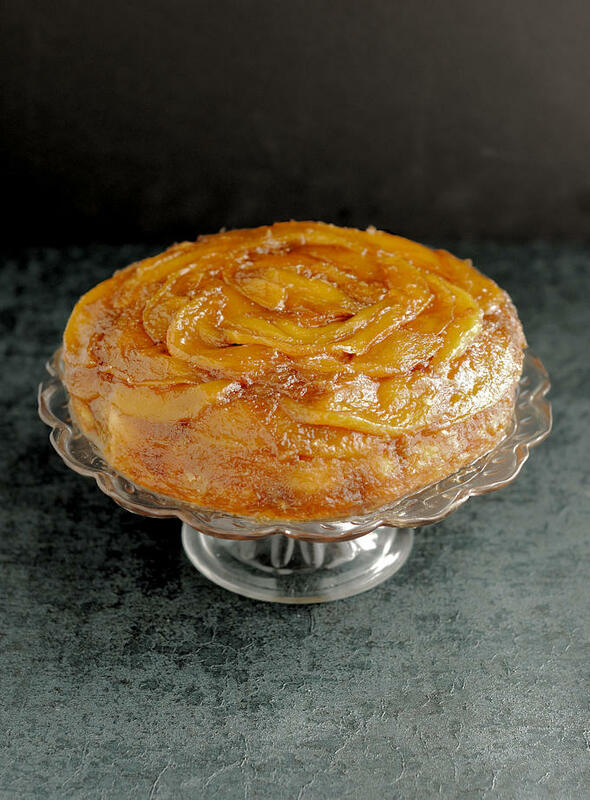 So this time I got impatient to turn out and finish this Mango Upside Down Cake. I wanted to shoot the photos before I lost the afternoon light, so I flipped the cake out just 4-5 minutes after it came out of the oven. I’ll admit that after making 1000’s of cakes over 20+ years I have pushed the limits of flipping hot cakes out of the pan on many occasions. 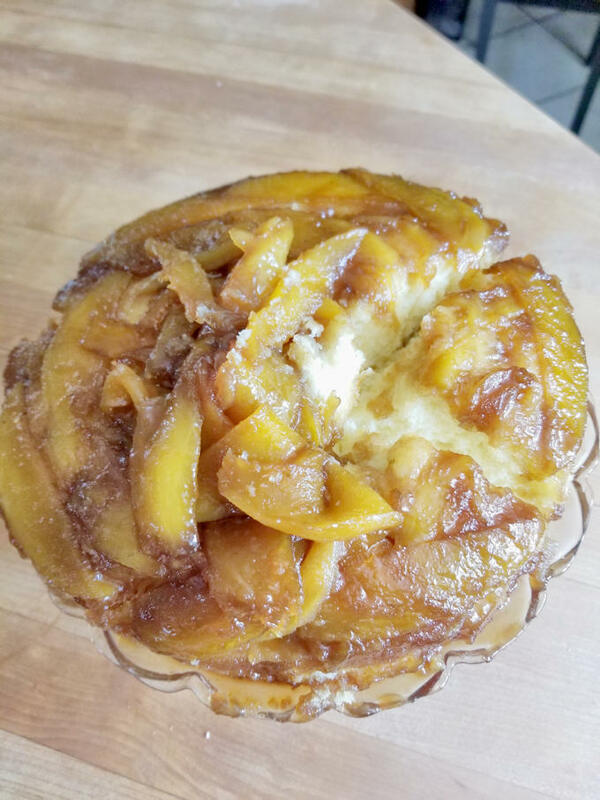 See what happens when you (and by “you” I mean “I”) flip a way-too-hot Mango Upside Down Cake out of the pan? 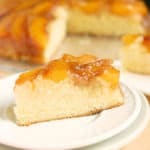 The cake cracks right down the middle and hot caramel and fruit slide off the cake. Lovely, isn’t it? Definitely not the most photogenic cake. So, I took to social media to call myself out for impatience and figured I would have to make the cake again before getting photos. About half an hour later I walked back into the kitchen to deal with the mess I’d made. My younger self would probably have thrown the cake away. 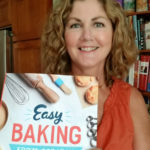 After 30 years of baking I still make dumb mistakes, but I’ve also learned how to fix a lot of those mistakes. They say you learn more from failure than from success. Here I was, presented with another great learning opportunity. You’d never know that the lovely cake in this photo is the same one that almost fell apart. How could I put it back together? It’s science, baby! 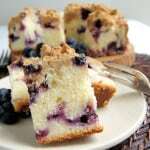 Flour is made up of protein and starch, both of which contribute to the structure of a cake. You can read more about flour in cake batter, but what’s important for this story is how the starch works. 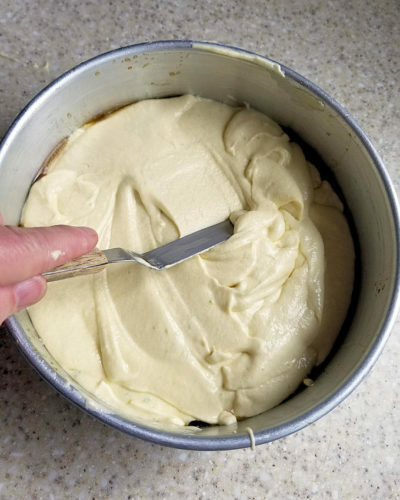 When you mix cake batter, the liquid in the recipe comes in contact with the flour. The starch in the flour absorbs some of the liquid, swells up, and gels. As the batter bakes, the swollen starch sets-up to help form the physical structure of the cake. 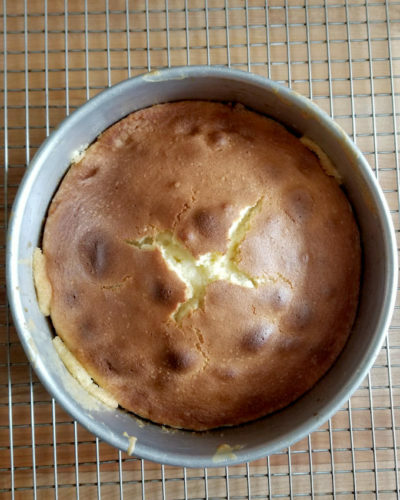 Once the cake is out of the oven and cooling, the starch molecules begin to crystallize. Because I flipped the hot cake out of the pan too soon, I didn’t give the starch time to crystallize enough to support the cake structure. The hot caramel and fruit on top certainly didn’t help. I was able to repair the cake when it had cooled enough for the starch to support the structure. Luckily, the starch was still soft enough to “glue” the cracks back together. Was the repaired cake perfect? No. Admittedly, the slices with with cracks were a little wonky. If someone was paying for for this cake I would have rebaked it. But it was fine to serve to my friends. They didn’t mind at all. It also looked good enough to photograph. Anyway….the reason for this long and drawn out story it to remind you that everyone makes mistakes in the kitchen. Also, remember that many of those mistakes can be fixed. Embrace your mistakes and consider them a learning opportunity. 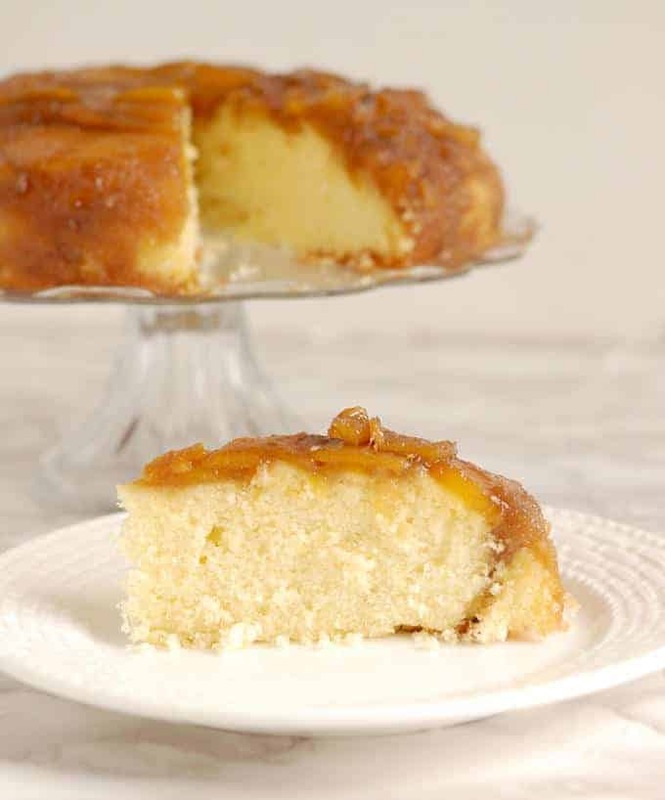 A super tender cake made with buttermilk and almond flour is topped with fresh mango slices and buttery caramel with a hint of lime. Preheat the oven to 325°F convection or 350°F regular. 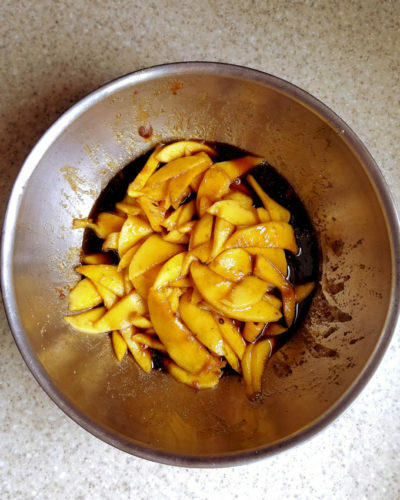 Toss the mango slices with the brown sugar, lime zest and lime juice. Allow to macerate for 30 minutes to an hour. Drain the mango and reserve the juices. Combine the mango juice with the butter in a small saucepan and bring the mixture to a boil. Allow to boil for 1-2 minutes to thicken. 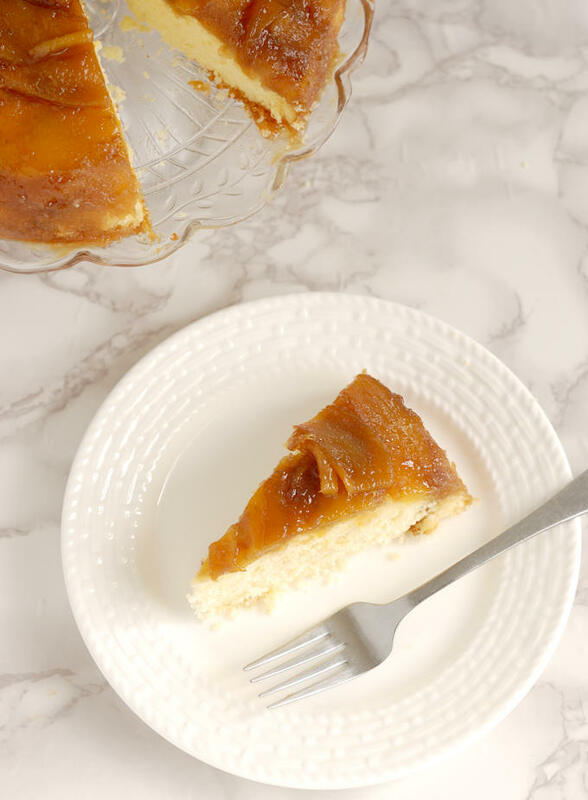 You should end up with about 1 cup of caramel. 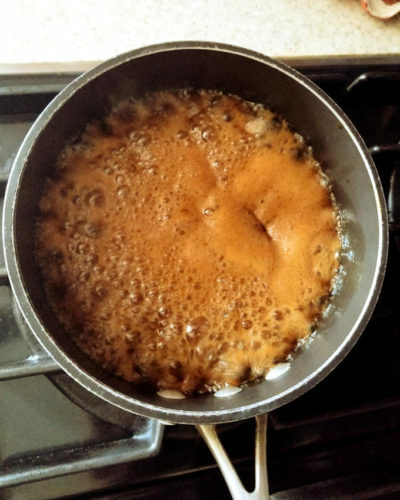 Pour the warm caramel into the prepared pan. 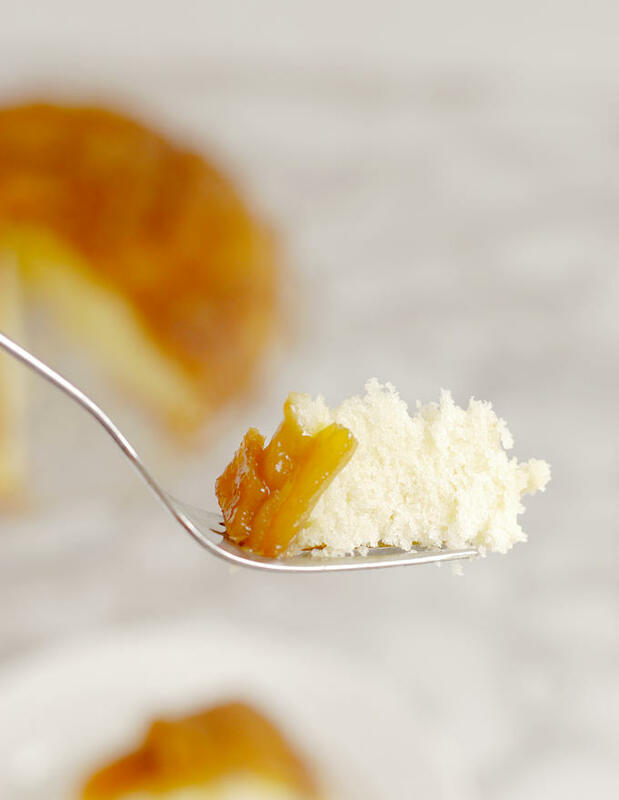 Arrange the mango slices in an attractive pattern onto the caramel. 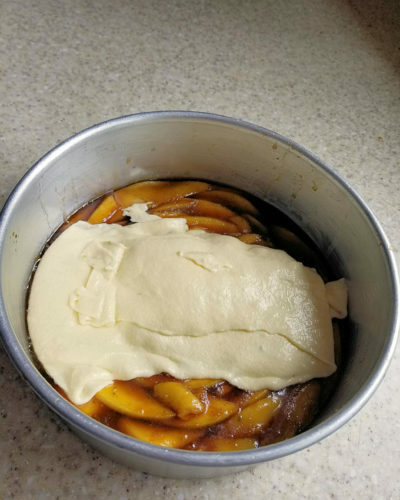 Place the pan in the freezer while preparing the batter. Combine the egg, yolks, 1/4 cup of the buttermilk, the vanilla and lime zest in a small bowl. 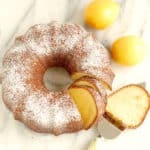 Sift together the flour, salt, and baking powder in a mixing bowl, add the sugar and almond flour. Run the mixer on low speed for 30 seconds to combine the dry ingredients. 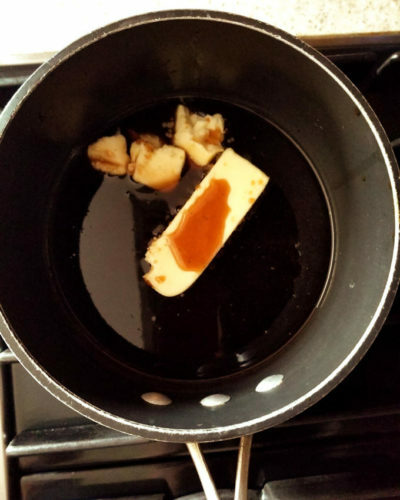 Add the butter to the dry ingredients and mix until combined. Add the remaining 1/4 cup of buttermilk to the flour and butter mixture. Turn the mixer to medium high for 2-3 minutes. Turn off the mixer and scrape the bowl and paddle. Add the egg mixture in two batches, scraping between additions. Starting from the outer edge of the pan, gently dollop the batter over the mango slices. Spread the batter to an even layer. 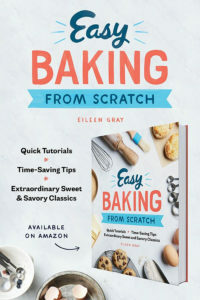 Bake until the center of the cake springs back lightly when pressed, or a toothpick inserted in the center comes out clean, about 30 minutes. Cool in the pan for 10 minutes. 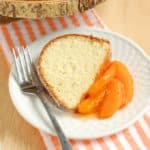 Unmold the cake while it's still a little warm by running a paring knife around the sides of the cake and inverting onto a serving platter. 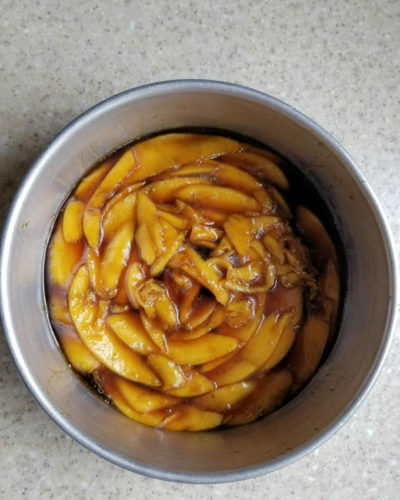 If any caramel or mango slices stick in the pan scrape them out with a small spatula and replace on the cake while still warm. The best substitute for fresh buttermilk is dry buttermilk. Otherwise use a 1/2 cup of whole milk with 1 1/2 teaspoons of lemon juice or white vinegar added. Hi Eileen! This sounds so delicious! 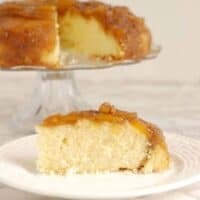 Could this recipe be used for an old fashion Caramel Cake? 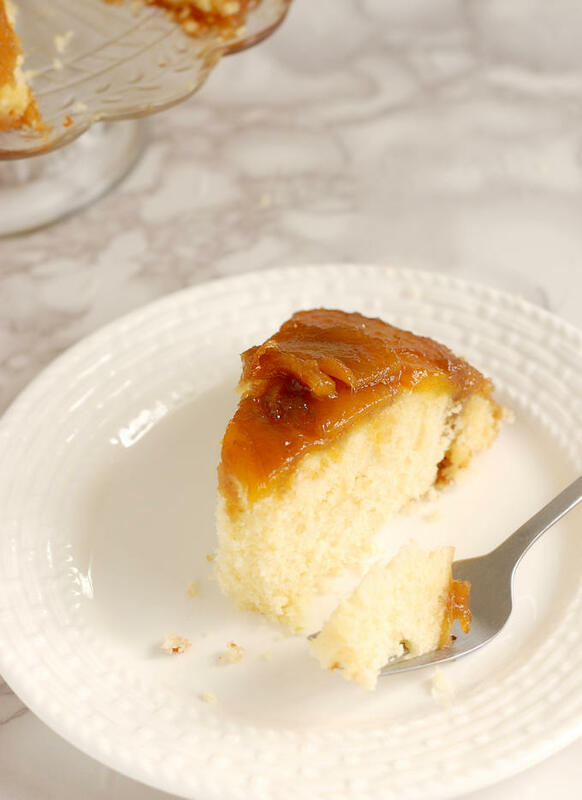 Do you have a Caramel frosting recipe? Thanks in advance!